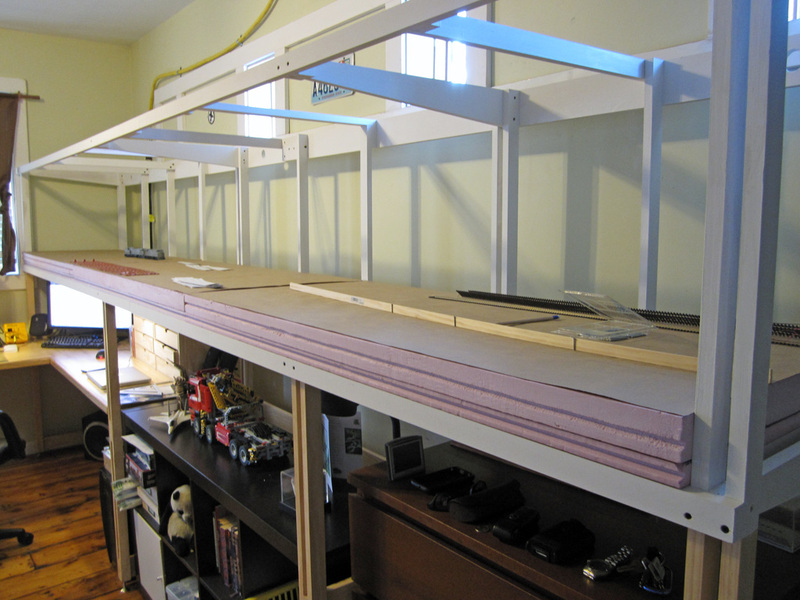 The base boards are made up of 3 equal sections each comprised of two layers of foam board. The first layer is 1” thick and the second layer is 2” thick. Next time I do this I will use 3 layers of 1” thick board. The 2” board was much more difficult to work with and wasn’t as precise in its factory dimensions as the 1” was. Still, it was expensive, so I went ahead and made do. Once I had the base boards cut and in place (they just rest on the bench work, no glue necessary) I used some double stick tape to secure Kraft paper to the top. I took this extra step so that I could make changes and fix mistakes without marring the surface of the foam. In case you missed my previous post, here’s the track plan, sans staging yard. To draw the centerlines, I used a long aluminum straightedge and a bendable stick that I picked up at Home Depot for a couple of dollars. I first drew out the straights, separating each track by 2” then I used the stick to trace the curves, inserting nails into the foam to hold it in the correct position. I increased the separation between tracks at curves by a quarter inch or so to allow for added clearance. I didn’t really bother with easements, the curves are shallow and the layouts orientation will make it difficult to notice their absence. For the turnouts, I downloaded templates from the Central Valley website, printed them full size and cut them out. I used #9’s for the crossover, #8’s for everything coming off the mainline, #7’s for all yard and siding track and a single #6 on the transfer span. I started with the tracks I had already drawn, marking the diverging routes with the templates, then using the stick to draw in the center line. I proceeded in this manner until I had everything down and it looked both realistic and functional. Using the stick to lay out a curve. For the final step I ran a ponce wheel over all the lines. This punched through the paper and left a track of indentations on the foam. Then I removed the paper and used the straightedge and stick, aligned with the holes from the ponce wheel, to redraw the lines directly to the foam with a Sharpie. Technically, I could have done this from the very beginning, but like I said, I wanted to be able to fix mistakes without marking up the foam too much and causing confusion. Now that I know the track plan will work, I’ve been proceeding with the next steps. I’m in the process of installing the lighting (an update about that will be appearing soon). 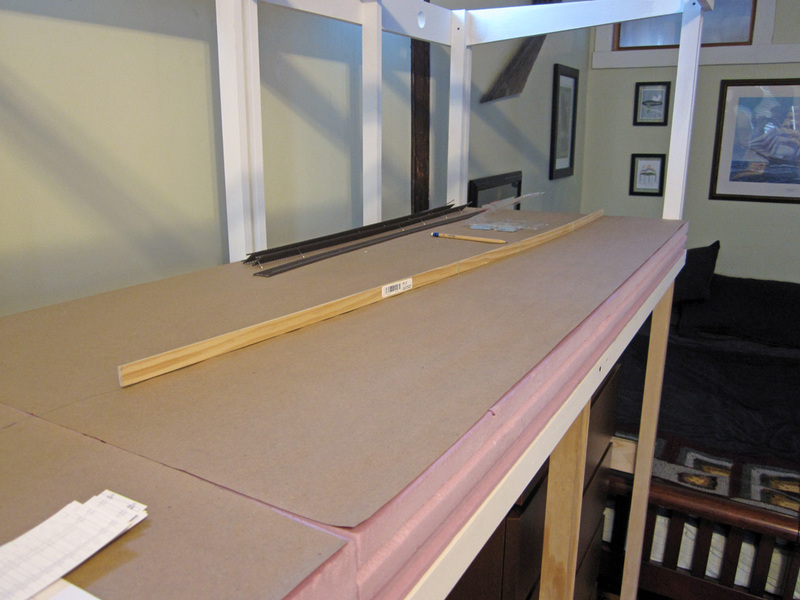 Next I’ll glue the various base layers together, then it’s time for the backdrop. This entry was posted in Layout, Model Railroading, Proto:87, Track and tagged Layout, Model Railroading, Proto:87, Track by Milepost15. Bookmark the permalink.